Staycation anyone? Sonoma County is home to many options, but one that rises above the others is Safari West. The place is just like it sounds – it provides the opportunity for parents and kids to experience a safari without the hassle of flying abroad. In fact, many visitors who have been on safari will comment that they see more animals on a tour of Safari West than on other safaris. What makes Safari West so magical? Maybe it is rooted in the owners’ passion for animals. Safari West was started by Bay Area locals Peter and Nancy Lang. Nancy Lang was an ornithologist and curator at the San Francisco Zoo, while Peter Lang’s father Otto Lang was a movie and TV producer with a passion for incorporating animals into his work (“Snows of Kilimanjaro,” “Sea Hunt” and “Flipper”). With backgrounds like these, it’s no wonder Safari West is a showstopper. Peter and Nancy opened Safari West to educate the public concerning the necessity for wildlife conservation in 1989. Safari West is a wildlife preserve situated in Sonoma County. Spanning over 400 acres of property, Safari West houses over 800 exotic animals, some of which are even classified as being extinct in the wild. Safari West is a reservations only venue. It provides various visiting options. Visitors are able to tour the grounds, dine and even stay overnight. The tours occur on safari jeep-type vehicles and last about three hours. Two hours or so are spent on the riding tour and the rest is a walking tour of the main grounds. 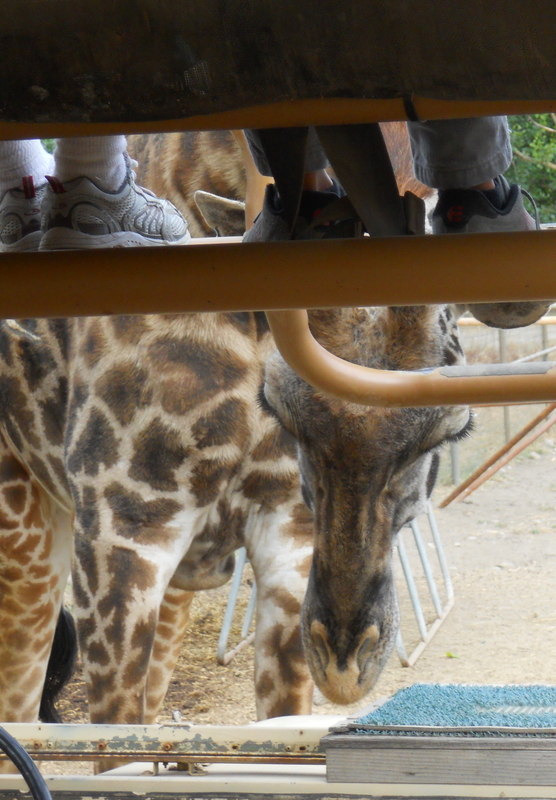 My husband and I took our 22-month-old son, Bobby, to enjoy the tour of Sonoma County’s own safari experience. The tour gathers in a central area surrounded by unusual wildlife confined by fences. Walking into Safari West, Bobby was greeted by attentive lemurs. The lemurs play on an island surrounded by water that is a perfect place for walking tots to see the friendly lemurs and spy the abnormally large coy fish. Then, Bobby noticed giraffes, gazelles, parrots and flamingos in the distance. As we waited for our tour to begin, Bobby noticed a “meow meow,” not of the usual neighborhood variety, but rather a rare serval cat named Bubba. Of course none of these animals could compete with the tour trucks. Bobby was itching to get on and get going. The trucks offer two levels of seating but to sit on the top level, kids must be 45 inches tall. Safari West has a cute sign painted like a giraffe that depicts how tall kids must be to ride on top. One kid was on his tippy toes telling his dad he was tall enough to ride on top. I mention this as if your little one(s) is/are shorter than the designated limit, you might want to prepare them ahead of time as to avoid disappointment. Obviously, Bobby and gang sat in the main part of the truck. The driving tour takes you around the grounds in four distinct stages. The first part explored the animals that were visible in the main area, while the latter parts were in individual gated areas. In the first area we were greeted by friendly giraffes. These giraffes came right up to our truck and spent quite a bit of time hanging out with us. Bobby was and is in love. The second part included seeing a couple of white rhinos interacting with native wild turkeys—one of the many experience you won’t find anywhere else in the world! And for those of you trivia buffs, it’s worth a Google to see how white rhinos got their name. On the third and fourth parts of tour, we saw various types of antelopes gazelles, and exotic birds. Lots of the animals seemed friendly as they ventured close to our truck. Others seemed disinterested in the visitors and just continued about their business. At one point we saw a herd of cape buffalo. These mighty animals were just lounging about. The guide explained that they were one of the seven deadliest animals in the world. Apparently they remember specific hunters who kill members of their herd and will pick them out of a group to avenge a fallen member. Amazing that there was nothing between us and them—and thankfully no one in the jeep had been hunting them. Consider the age of your kids first. You don’t have to go on a riding tour to enjoy Safari West. Although toddlers are welcome on the tour, the ideal age is 4. If your child(ren) is/are under 4, then I’d recommend saving the jeep tour for later. We thought it was the perfect idea until we realized we weren’t allowed off the jeep for the entire two hours. Alternatively you could go and enjoy lunch at the Savannah Café. That way, you will be able to get a taste of the safari wildlife without the challenge of keeping your young ones happy and safe on a jeep tour. If you go for lunch, plan some time to wander the main part of the grounds and see some giraffes, gazelles, wildcats, parrots, monkeys—and even a cheetah. If you are interested in a riding tour, neither rain, snow, nor hail detours the dedicated guides. My guide suggested spring as an ideal time to visit. During spring, the hills are painted green with grass, which makes for a lovely scene. Also, springtime offers overcast and cool days, which encourage animal activity. But there can be overcast mornings any time of year. My morning tour in late July was luckily overcast so we were able to beat the heat that Sonoma Valley is so well known for. The tours are at 9 a.m., 10 a.m., 1 p.m., 2 p.m. and 4 p,m. The 9 a.m. tour was ideal for Bobby as it did not interfere with his afternoon nap. They like everyone to arrive a few minutes early, as it give them a chance to figure out what jeeps to place what groups. The safari ride, while amazing, is extremely bumpy at times. There are no seat belts (except on the top row seats), yet kids need to be restrained as they could literally fall out of the jeep at different points of the tour. If you go with a young child, be ready to act as their seat belt. My husband and I held Bobby close during the ride. In addition to presenting an issue for tots, the bumps present an issue for pregnant moms. If bumps make you uncomfortable or need to use the restroom, I’d save the tour until later. There are no restrooms on the tour. I did the tour at four months pregnant and was fine, but whether that would hold true at 5 or 6 months, I don’t know. Guests are able to enjoy a walk up cafe or a more formal dining experience at the Savannah Cafe. Delilah’s, the snack shop, offers a variety of to-go options. With a sandwich priced at about $8, you might think about splurging on a lunch at the sit-down Savannah Cafe. The Savannah Cafe offers a barbecue lunch and dinner. Lunch is $15 per adult and $12 per child over 4 years old. Dinner is $29 per adult, $17 per child over 4. I have to tell you that the lunch at Savannah Cafe smelt divine. Should you want to stay overnight (which is now a definite must on our list), Safari West has private tent cabins. Priced between $200 and $300 a night, they offer a unique opportunity for families to sleep amongst wildlife, albeit Sonoma County. Book your staycation on or around a full moon and get a discount – $150 a night. Safari West has some special offers for locals. Once a year it hosts an Open House where during this time shortened tours are given for deeply discounted prices and kids are free. Check back for an announcement. In addition, during the off-season (January – March), Safari West offers a mid-week deal for locals. This entry was posted in Uncategorized on August 12, 2011 by Modern Mama.